This may seem a trifle premature. However sunlight has returned north of 80 degrees, and it looks like there's currently some open water up there. As a result I've been musing about various matters that don't seem to quite fit in anywhere else, and so now I've taken the plunge with this thread! To set the ball rolling, here's an image of Svalbard on March 7th, courtesy of Terra bands 3/6/7. Would anyone care to suggest what's causing the blue/green colours north of the islands (amongst other places)? To set the ball rolling, here's an image of Svalbard on March 7th, courtesy of .... Would anyone care to suggest what's causing the blue/green colours north of the islands (amongst other places)? That area of water has been open most of the refreeze season. I don't think you are premature; there's discussion we may have hit peak extent in March 6th. We *might* have a cold snap which increases extent, but weather and insolation are pushing hard in the opposite direction. Would anyone care to suggest what's causing the blue/green colours north of the islands (amongst other places)? 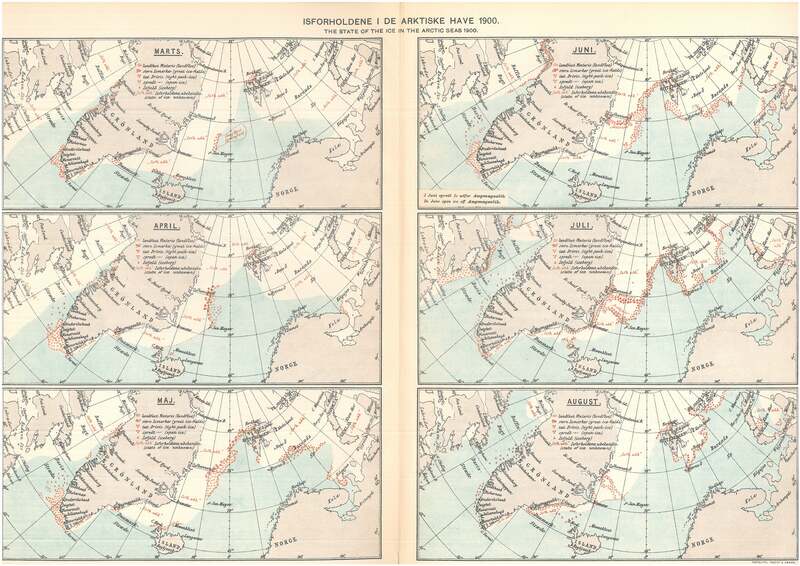 All of the concentration maps show open water north of Svalbard. Today Svalbard will receive over 10 hours of sunlight. As jdallen said above, we probably hit the peak extent for 2014 on March 6th. It would take a gain of over 229K km2 for that date not to hold. That much gain this late in the year is highly improbable. I'm wondering whether the intrusion of warm water from the North Atlantic will continue to nibble away at the ice in CAB from that quadrant. Time was, I thought that the knock out blow would be delivered here, as Atlantic Water surges straight up through the Fram Strait towards the North Pole. Chris Reynolds has made me question this; arguing convincingly that as the bathymetry changes in this area, and the sea bottom falls rapidly away, the saline AW will rapidly descend, and not interact so much with the surface sea ice. So there may be a limit to the AW-provoked ice retreat in this area. The bathymetry may limit the AW intrusion, but ice AW does chase off opens the way for wide scale surface warming via early exposure of high latitude ocean surface to sunlight. AW is also entering the Barents and pushing on from there; no drop off of ocean bottom there. I think we have a triple threat coming up this year. 3) Significant volume of older, thicker ice which has already been shoved into the Beaufort "ice grinder". The thin, weak ice in the Bering may play a role as well, as if it disappears early, that will similarly increase the regions heat budget. I suspect this melt season we will be watching a sharper than usual battle between competing feedback mechanisms. As the Atlantic continues to warm with this salty warmer water spilling into the deep Arctic basin, could the Gakkel Ridge or the more prominent Lomonosov Ridge cause an upwelling of this deep salty warm water in the CAB? Could such an upwelling near these ridges be the cause of the appearance of the Laptev bite? Intriguing but doubtful I think. Recent reading and discussion suggests warm outflow from Siberian rivers combined with other factors as more plausible. Jim, I think your timing is immaculate, and so I'm making this thread a sticky, replacing the Short to Medium Term Arctic Sea Ice Conditions Discussion thread. Jim, I think your timing is immaculate. Thanks Neven! There is however always a chance I might have jumped the gun slightly. As the ever excellent Wipneus points out this morning, there has been a modest "rebound" in the metrics today. IJIS/JAXA extent is now at 14,118,547 km2, with the maximum so far standing at 14,255,140 on March 5th. 1. Is the NSIDC daily Arctic sea ice extent number for March 8th 2014 the lowest on record for that day of the year? Yes or No? 2. Is the Cryosphere Today Arctic sea ice area number for March 8th 2014 the lowest on record for that day of the year? Yes or No? 3. Is the IJIS Arctic sea ice extent number for March 9th 2014 the lowest on record for that day of the year? Yes or No? Given the weather surrounding the Arctic right now I would expect the current maximum to get broken over the next few days and then to melt out fairly quickly as soon as conditions change the new ice is going to be very thin and melt out quite quickly when temperatures shift again. edit: then again I'm just eye balling temperature graphs probably not a specifically sound basis to make a judgement on. We might see extent pop briefly above the max we saw on March 6th. If we do, my sense is, it will be less the result of more freezing, more the result of dispersal. It looks like there will be a significant push of mid-latitude moisture and heat energy into the Kara Sea region beginning in about 3 days. Long range model forecast. 'Marts', top left is March. But all the research I've read, and the profiling bouy data, shows the AW layer as being well below the surface over much of the Arctic basin. My first ever reply here.. And my thoughts for this year is that given the last years behavior of the melt season we will see at least a 10 million km2 sea ice melt away.. Regardless of whether the maximum have been reached or not which at this time is more of an academical interest, I will make a somewhat conservative guess based on which would give a september minima at roughly 3,9-4,0 million km2 due to NSIDC numbers. That would yield the second lowest september minima ever. I don't believe in a new record due to last years cold weather. My wild card is that the North Pole will be essentially ice free this year... Last year the ice at the NP was very thin and only the cold weather prevented a new era in the human history to be reached.. I also believe that 2015 will be a very nasty year when sea ice will be sloshed away. El Niño seems to be coming. There is potential for another tropical cyclone in the WPAC during the next 7 days which certainly would help the westerly wind burst (WWB) there to continue.. I concur that there is an excellent chance that the pole will be mostly open water this year at the end of melt. I'm a bit more pessimistic regarding extent. If warmer weather conditions line up the way I think they will, I think this year may be the first to dip below 3.0 million km2. Not by much, mind, but in that ballpark. My premise is based on the assumption that all extents are nor created equal; the quality of this years ice at maxima is far poorer than either 2012 or 2013. Modestly warmer conditions will have a much greater effect than in the past. Serious warmth will be devastating. The best possible outcome I think we could anticipate ( which I'll give a 5% chance to) is a repeat of 2013. Thanks Neven! There is however always a chance I might have jumped the gun slightly. Of course, as soon as I say something about timing wrt calling the max, the max will come later. ...so if you never call it, it will never happen, right? Too early to call, I reckon. Over recent years the shape of the average line has changed, shifting to the right; instead of a normal bell-curve, it starts to increasingly resemble the profile of a cresting wave of seawater travelling from left to right. So Autumn anomalies from the 30year average have been huge; Spring anomalies have been tiny. The late March-April approach towards the longtime average has surprised and made a fool of me for the last 3 years. Not this time! OTOH, having been wrong due to not anticipating the late-Spring rally previously does not necessarily prove that I will not be proved wrong this year. Events in the Arctic and my predictions seem to be inversely correlated, at high confidence. Has happened to me too. I find odd comfort here, being wrong :-D. I think this year I'll call it on first week of April. If the maximum comes after this it'll be the first. IJIS/JAXA extent is now up to 14,233,829 km2. Over on the blog Al Rodger has suggested an ultimate binary outcome. Either I will be prove to be "the exact opposite of foolish", or merely "brave". For the moment at least I'm still in the former category! However now I'm wondering what happens to me if one or more metrics create a new maximum, but others do not? Steve Goddard keeps pulling new rabbits out of his hat, so perhaps I should try the same trick? By way of example, here's how DMI extent looks at the moment. Obviously it's not at a new low for the date, but maybe the maximum will hold and spare my blushes? ...perhaps I should try the same trick? my thoughts also, this is why I started tracking the longer averages, some of them might show this spring as 'the first'! Given the current wind patterns and resultant ice movement it looks like it could well be possible to hit another peak in maximum extent, but I'm pretty confident area is already on the down-slope. Three days ago I would have bet a few pints that we had reached the Extent maximum for this year! Now, we are only 21,311 Km2 below the current maximum. Given that there is so much rubble on all perimeters, it seems foolish to predict within +/- 100k what will happen in the next few days. I would be hesitant to call the maximum until Extent drops well below14M Km2 and holds that for a few days. Is the uptick the result of winds spreading out the already thin ice? I'm pretty sure it's combination of wind dispersion and sudden temperature reversal. I did predict that we would see the extent increase from eye balling projected temperature graphs earlier in the thread. Don't discount the effects of weather on the system the water and air temperatures are still at the point where a +-4 degree swing either way means large ice increases or sudden melting. So how could the max pan out? Looking at the next 10-day forecast by ECMWF, the general SLP-pattern is not very different from the one last year (NCEP/NCAR). The steering is clockwise, very rough Bering to Fram. A polar high and a Greenland ridge resulted in mild (for the time of year) 1000Mb temps then, producing a smooth extent fall of about 20K/day after the max 14th March. I assume this fall will prove close to what’s about to unfold now. For a while, the Northerlies, combined with -15 to -20 temps, can cause some flimsy extent growth on the Atlantic side. ECMWF suggests the ‘back door’ to get interesting later on (Bering/Chukchi). That’s what might be decisive; there’s just not enough cold left to really extend the freezing season. Most of what’s left is still running to wear out Canadians and Americans (wish you some spring weather soon …). Given the pattern, I’d point at 19 or 20 March maybe to become the max day. How much over 14255K depends on how the rubble and flimsiness will be counted by IJIS/JAXA. BTW Nice pic of rippling frozen foam and nilas, Jim. I suppose it won't get a chance to stabilize anymore. No blushing needed from me just yet. The NSIDC daily extent number for the 12th came out up from 14,618,420 at 14,753,210 km2. Welcome to the club, Jim! I have here a very long list of metrics. Only one domino has fallen so far. Don't start gloating just yet! 2SD is fine with me. This Winter has sucked in the Midwest. It's looking a bit crumbly at the southern end today. Try looking back a few days as well. Look further south too. Todays number from IARC-JAXA was rather nice with only a very small uptick which makes me quite confident to say that the maximum is reached or almost reached. Small fluctuations the next days will next week switch to a rather sharp decrease as we now are entering the second half of march.. The ECMWF forecast for the next 10 days is quite interesting.. It seems to be a one more (and last?!) cold blast to North America while the Siberia is quickly warming up while the Arctic cold is displaced for NA. The 850 temp for +240h indicates warm air at Berings sea. For next week I say: Let the melting season 2014 begin!!! Welcome Lord Vader! Are you by any chance from somewhere near Kiruna? As luck would have it I do know a very good candidate for the position of Princess of the Ice. Snow White! Whilst we wait to see if any more area/extent dominoes fall she and I have been pondering the even more controversial subject of sea ice thickness. Obviously all that new ice around Svalbard is pretty thin, but what about the "old" ice in the Beaufort Sea we asked ourselves. Surely that must be pretty thick by now? According to ice mass balance buoys 2013F and 2013G, apparently not! Well, king of the ice got me too. I kept trying Ymir, but that wasn't good enough. I don't think that volume conditions in the Arctic Ocean present a major impediment to substantial melt this year. Weather will be the decider. Thanks Chris. Most interesting as always. For what it's worth, given my current track record, I agree with you about the impediments and the weather! What's the weather forecast for next week? Quite a nice view North of Svalbard today. Another interesting thing is that the GBH which have been quite abscent during virtually the whole winter seems to be building in more and more now. Thanks Jim Hunt! :) And, everything is relative but if we consider about 1000 km south from Kiruna as "close" then the answer is "yes" The spring is here and today is a really sunny day!